There is a divine spark in all of us. And so, there is hope. For light is a compelling force which will always triumph over darkness. A Jewish woman has invited the Shabbat Queen into her home. The darkness of the day’s headlines recedes, exiled by the peaceful glow of candles. It is truly a gift on high. All that is good, all that is holy is symbolized – indeed realized – in the flickering light of the Shabbat candles. It is customary to put a few coins in a ‘pushka’ (charity box) before lighting candles. 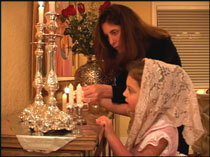 The correct time to light the Shabbat candles is 18 minutes before sunset every Friday night. Young girls should light just prior to this time.